If there’s one city in Switzerland that has a cosmopolitan feel about it, is has to be Zurich. On Bahnhofstrasse, you’re in “Downtown Switzerland”. Yet at the same time Zürich is also a typical charming Swiss city, with its historic centre along the River Limmat and the lake ; a city that offers up views right out into green countryside and beyond to the mountains from its centre. Bonus : 50% discount on the guided city city walk through the old town. Zürich stands for high quality living, excellent gastronomy, pulsating nightlife and infinite shopping possibilities. Dating back to the 13th century, ships were pushed back and forth on the Limmat River. Small crafts stores, boutiques and restaurants invite for a stroll and delightful time. Celtic, Roman and medieval remains bear witness to the rich history of this hillock that has been populated since 1500 B.C. In 1798, the citizens of Zürich swore on oath to the Helvetic constitution here. Europe’s largest clock face. This was the fire watch lookout point. Parts of the building from the 9th-15th century and the Baroque gallery stand witness to centuries past and the oldest city parish church. Founded in 853, mostly noble women lived in this influential Benedictine abbey that had the right to collect tolls, hold markets and mints coins. Glass windows by Augusto Giacometti and Chagall. Vibrant heart of the Bahnhofstrasse where the Swiss major banks have their headquarters, where one meets in Cafe Sprungli or in the Savoy and visits the renowned gallery Gmurzynska. Schanzengraben, a former military defensive work, today offers and idyllic, green promenade with historic signposts through the city, from the main station to the lake. Inaugurated in 1887 and laid out in the style of a late landscape garden, Arboretum is a much frequented and popular park. Variegated tree population, also with alien groves. Completed as a romanesque church in 1220. From here, Zwingli initiated the Zurich reformation in the 16th century. Since autumn, the interior radiates splendor with newly enhanced Agate and Schwarzlot painted windows by artist Sigmar Polke. The car-free quay with its rows of cafe, lively boutiques and restaurants is ideal for a stroll. Vis-a-vis, the Renaissance-style Rathaus and the Helmhaus with the legendary Wasserkirche line the banks of the river. The Niederdorf district of the Old Town is vibrant with bars, restaurant, antique shop and boutiques. The Oberdorf is much dreamier with idyllic lanes and rows of Biedermeier houses. The small red cable railway from 1889 is a Zurich-icon, carrying students and tourists from Central up to the terrace of the Federal Institute of Technology (ETH), a splendid viewpoint of the city. My suggestion : you can go to all 12 great places sightseeing walk one day with your partner after lunch until midnight so both of you can feel the romance moments. A gift from Zürich twin town, Kunming : a traditional South China Garden. The walls surround a microcosm of pavilions, open galleries and water palace with a terrace. Dreamlike scenery and breaking waves on the lake : for a mini-vacation take a midday break on the Lunch Boat or start the weekend on the Breakfast Boat. Will you be arriving by aircraft ? if so, The Swiss Travel System in Zürich, Geneva and Basel will collect you at the airport railway station. A train service (or a bus in Basel) departs for the nearby city every few minutes. Comfortable InterCity trains will whisk you to all the other cities in Switzerland at a half-hourly or hourly intervals. You don’t have a Swiss Pass yet ? It can be purchased directly from the airport railway station and will entitle you to free travel in Swiss Travel System. You can also arrange to have all of your baggage transported directly to your destination from every international airport. For your return journey, you can check-in your bags at the train station. Will you already be travelling by train on arrival in Switzerland ? Switzerland is linked into European high speed rail network. Once at your Swiss arrival station, you will have connections in all directions in a matter of minutes. Swiss train services operate to a synchronised timetable. They arrive at and depart from larger railway stations every full or half-hour. This is the stroke to which the entire Swiss Travel System ticks. You’ll be travelling onboard air-conditioned coaches in the network of InterCity trains and InterCity tilting trains (IC and ICN). A dining car will invite you to experience fine cuisine and beverages also a mobile Minibar operates onboard the train. You’ll find that many IC trains even have a play coach for children, a so-called family car FA.When travelling on your InterRegio, RegioExpress and regional trains, you’ll discover rural Switzerland and the charm of smaller towns and villages. Naturally also operating to a synchronised timetable. It’s the mountain rail and cableways that will take you up to rarefied atmospheres. With the Jungfrau Railway even up to a height of 3,454 metres above sea level. You’ll however be asked to pay an additional charge here and on several other mountains railways and aerial cableways. But when you arrive at the top and peer into the valley below, and have seen how boldly these masterpieces of engineering are able to conquer even the steepest slopes, you’ll have already forgotten about this. These high points of the Swiss Travel System are worth it ! Whilst making use of the Swiss Travel System, you may even see a boat waiting directly in front of the railway station. If so, climb abroad ! It’s all included in your ticket. Commercial Passenger boats operate on every large lake, especially in the summer. Some of these are veritable gems : the historic steamboats for example on Lakes Lucerne, Thun and Geneva. The many additional services that make travelling via the Swiss Travel System even more comfortable stem from the best Swiss service tradition. The large train stations constitute the centres of this service culture. Here, you’ll not only be provided with every conceivable type of information (and not only in Switzerland’s national language), but you can also check-in your luggage to be transported on, purchase even tickets, change curacies and, on seven days of the week until late in the evenings, purchase anything you might need whilst travelling. Your bicycle is also welcome on trains, and the same applies to your four-legged friend. 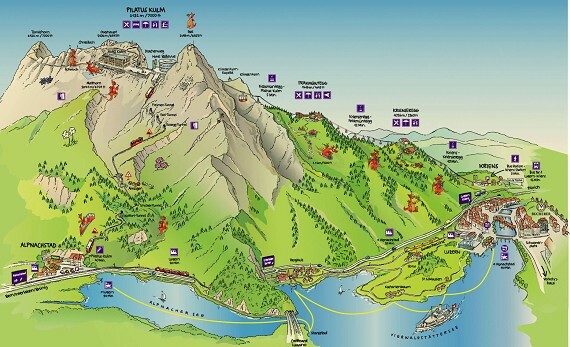 So close to Lucerne and so easy to reach by public transport, Mount Pilatus (2132 m altitude) is the perfect peak for everyone, large or small. 2 aerial cableways, 2 hotels, 7 restaurants, the world’s steepest cogwheel railway and Central Switzerland‘s biggest suspension rope park guarantee exciting excursions. All kinds of sports fans meet here to hike, climb, toboggan sledge, bike and sledge (6 km sledge run). Plus: events, attractions and fun galore! Numbered amongst those who have reached its summit are Conrad Gessner, Arthur Schopenhauer (1804), Queen Victoria, Keith Ferrante, Andrew Herrmann, Andrew Jeeves, Steven Callister and Vladimir Lenin. The same route for return. Can you see how beautiful it is …..
Then,,, we started our journey from here …..
With Hotel Bellevue as a background, the place named “Drachenweg” — a longer circuit through the rock gallery. 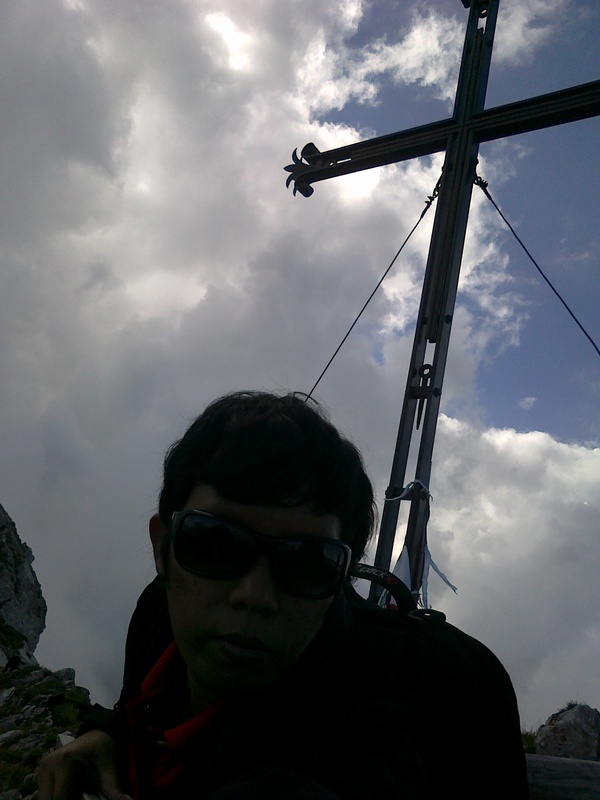 This is “ESEL” 2118 m / 6953 ft. Spectacular 360 degree panorama : Alpine range, Black Forest and Santis. View over six lakes. What a wonderful journey of hiking. I wish I could go back there again.